A distal biceps rupture most often occurs in men in their late 40s, but it can occur at any age(in adults) and rarely in women. The biceps tendon starts as 2 tendons at the shoulder and forms 1 tendon at the elbow where it inserts onto the proximal radius. Shoulder tendons, like the rotator cuff, are more broad and flat. Biceps tendons are more cord-like, similar to the achilles tendon on the back of the ankle. Rupture or separation of the biceps tendon from the radius usually occurs during heavy work or heavy lifting. The biceps muscle goes from the shoulder to the elbow on the front of the upper arm. Tendons attach muscles to bone. Two separate tendons connect the upper part of the biceps muscle to the shoulder. One tendon connects the lower end of the biceps to the elbow. Contraction of the biceps muscle causes both elbow flexion and wrist rotation from a palm-down to a palm-up position. The biceps can also help flex the shoulder, raising the arm up. The lower biceps tendon is called the distal biceps tendon. The word distal means that the tendon is further down the arm. 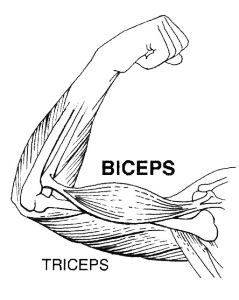 The upper two tendons of the biceps are called the proximal biceps tendons, because they are closer to the top of the arm. The distal biceps tendon inserts on a small bump on the radius bone of the forearm called the radial tuberosity. What causes a distal biceps rupture? The most common cause of a distal biceps rupture is when someone lifts a box or other heavy item with the elbows bent. Often the load is heavier than expected, lifted quickly, or the load may shift unexpectedly during the lift. This forces the elbow to straighten, even though the biceps muscle is working hard to keep the elbow bent. The biceps muscle contracts extra hard to help handle the load. As tension on the muscle and tendon increases, the distal biceps tendon snaps or ruptures where it connects to the radius. This can also occur during sports or a trauma if similar force are applied to the biceps tendon. What symptoms are caused by a ruptured distal biceps? When the distal biceps tendon ruptures, it usually sounds and feels like a pop directly in front of the elbow. At first the pain is intense. The pain often subsides quickly after a complete rupture and is usually not a prominent symptom. Swelling and bruising in front of the elbow usually develop shortly after the pop. The biceps may appear to have balled up closer to the shoulder, and their may be a palpable defect or divot in the from of the arm above the elbow. Usually, one can “hook” the bicep tendon with the index finger on the opposite hand if the biceps tendon is intact. Inability to do so signifies a rupture. The arm often feels weak with attempts to bend the elbow, lift the shoulder, or twist the forearm into supination (palm up) such as with a screw driver. Fatigue can also be an issue. The distal biceps tendon sometimes tears only part of the way. When this happens, a pop may not be felt or heard. Instead, the area in front of the elbow may simply be painful, and the arm may feel weak with the same arm movements that are affected in a complete rupture. Diagnosis is usually made by physical exam, but x-rays and MRI are sometimes recommended. Timing is critical for the treatment of this problem, as delays in treatment can complicate surgery and worsen outcomes. It is very important not to delay seeking treatment. Many doctors prefer to treat distal biceps tendon ruptures with surgery. Nonsurgical treatments are usually only used for people who do minimal activities and require minimal arm strength. Nonsurgical treatments are only used if arm weakness, fatigue, and mild deformity aren’t an issue. If you are an older individual who can tolerate loss of strength, or if the injury occurs in your non-dominant arm, you and your doctor may decide that surgery is not necessary. Not having surgery often results in significant loss of strength. Flexion of the elbow is somewhat affected, but supination can be very affected. Nonsurgical measures may include a sling to rest the elbow. Patients may be given anti-inflammatory medicine to help ease pain and swelling and get them back to activities sooner. These medications include common over-the-counter drugs such as ibuprofen. Exercises are used to gradually strengthen other muscles that can help substitute for the function of a normal biceps muscle. People who need normal arm strength get best results with surgery to reconnect the tendon right away. In most cases, surgery is recommended. Early treatment is needed to avoid tendon retraction. When the tendon has been completely ruptured, contraction of the biceps muscle pulls the tendon further up the arm. When the tendon recoils from its original attachment and remains there for a very long time, the surgery becomes harder, and the results of surgery are not as good. Surgery involves an cut in the front of the elbow to retrieve the ruptured tendon end and reattach it to a drill hole in the radius. This is usually facilitated with a small metal implant, anchor, or suture button that can be left in place and does not have to be removed. Numbness or nerve irritation over the front of the forearm is common after surgery but almost always temporary. When the repair is complete, the skin incisions are closed, and the elbow is placed in a protective brace or sling. The surgery is done as an outpatient procedure under general anesthesia. Immediately after surgery, if the repair is secure, immediate motion in a sling is allowed. Sometimes a protective splint or brace is used that allows for limited motion. The hand and wrist can be used for light activities and activities of daily living around the house. Exercises for the biceps muscle are avoided until at least four weeks after surgery, often under the supervision of a physical therapist. Unrestricted everyday use is generally allowed after 2 months, but strenuous lifting is limited until 6 months after surgery. At about six weeks, you start doing more active strengthening. As you progress, your therapist will teach you exercises to strengthen and stabilize the muscles and joints of the wrist and hand, elbow, and shoulder. Other exercises will work your elbow in ways that are similar to your work tasks and sport activities. Your therapist will help you find ways to do your tasks that don’t put too much stress on your elbow. Outcomes for people who are managed in a timely fashion are generally excellent.